Do we need more hungry kids? Amodei says YES. During the Great Recession, enrollment in SNAP, the Supplemental Nutrition Assistance Program, doubled to 47 million. Benefits average $133 per month. Most of the beneficiaries are children, elderly or disabled. $133 per month is $4.37 a day, and even with that, the Sodexo Foundation estimates that 17 million American children go to bed hungry every night. No telling how many more there will be after the Recovery Act’s 13% boost in SNAP benefits expires on November 1st. But it gets worse. On September 19th, the House of Representatives approved H.R. 3102 by a vote of 217 to 210. This bill cuts another $40 billion from SNAP over ten years through a number of rule changes, from delinking nutrition assistance from other anti-poverty programs to limiting childless recipients to 90 days worth of benefits, regardless of need. The Congressional Budget Office estimates that H.R. 3102 would remove four million beneficiaries from SNAP in 2014, another three million a year after that. To their credit, not a single Democrat voted in favor of H.R. 3102. Fifteen Republicans voted no, but Rep. Mark Amodei, R-NV, was not one of those brave souls, all of whom will no doubt be primaried in 2014 by forces on the far right of their party. The lesson for voters who care about hunger in America is simple: party matters. Look closely at what each party in congress stands for, and vote for the candidate of the party that shares your values. Politics is about policies, not personalities. 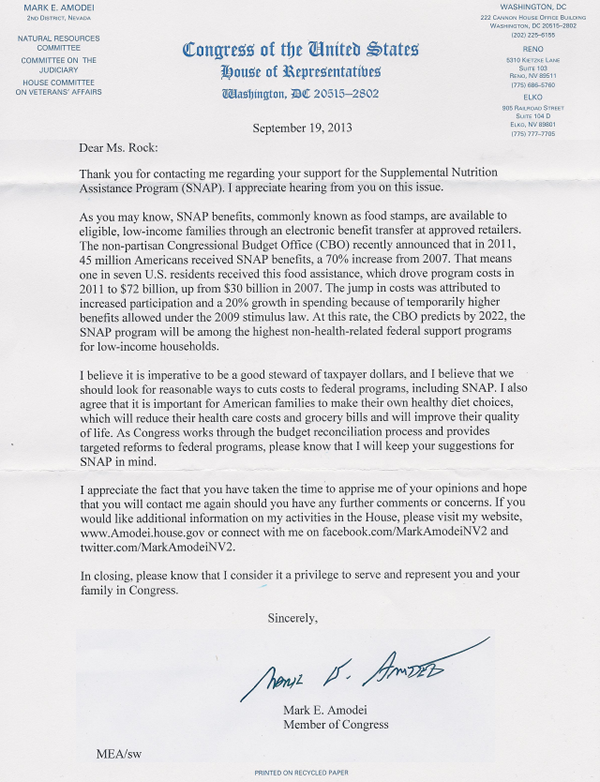 I seriously disagree with Mr. Amodei that a “YES” vote is equivalent to “good stewardship” of taxpayer dollars and that in doing so, former SNAP recipients dumped from those roles would thus be able to make better and healthier diet choices that would reduce their health care and grocery costs. The only thing that’s going to be reduced is their grocery bill, in that they won’t have sufficient money to put food on their tables. And, if Mr. Amodei somehow thinks that starving people is going to help reduce their health care costs he must be a truly hard-core believer in the GOP’s “hurry up and friggin’ die” health care plan for the United States of Republica! Nevadans may not have sent Sharron Angle to the Senate, but NV-CD2 certainly sent a Sharron Angle Wannabee to the House. We need to fix that in 2014!